today I am guest designing for The Stamp Market and I am really happy with the bulk cards I made. They are super cute as a set to give to a friend or individually to send to those who need it. I used four stamps given to me by the Stamp Market to create these cards: Dotted Background, Feeling Floral, Botanicals and Double Take. I had an idea to make some bulk cards with colourful background but black and white elements to keep the cards clean and simple. 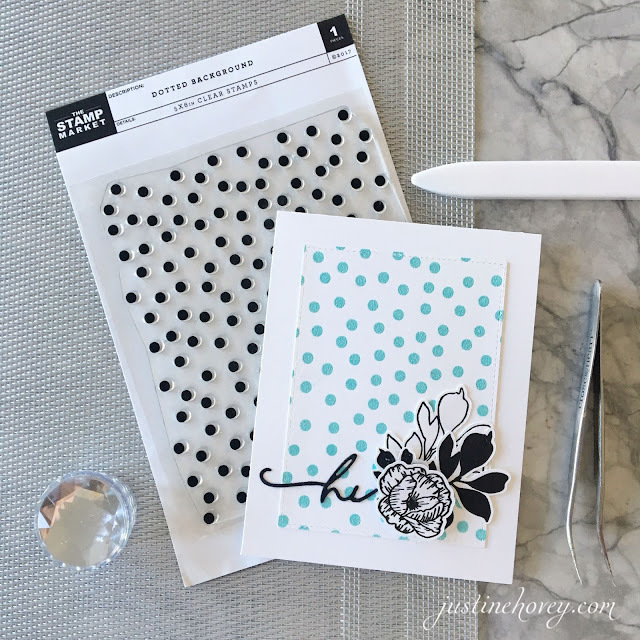 I purchased some Nuvo embossing powder in various colours quite a while ago and it was the perfect opportunity to give them a try. After embossing the backgrounds, I cut them down using a stitched rectangle die. 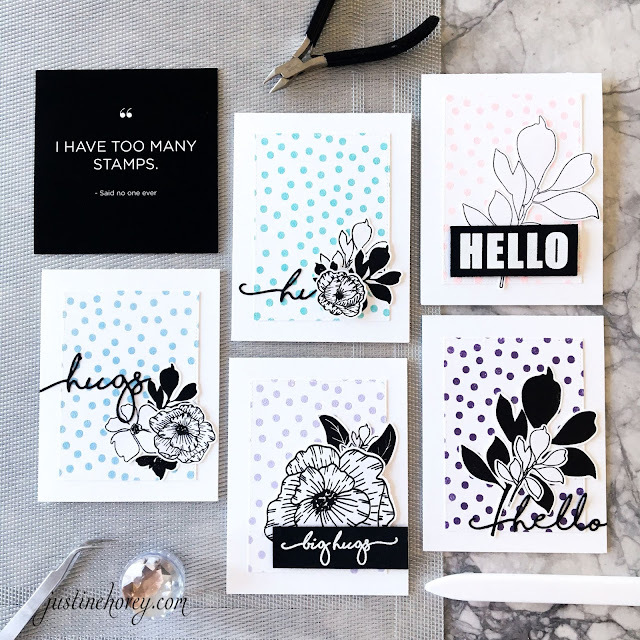 After I finished up my backgrounds, I die cut a bunch of sentiments using the Double Take Stamp and Die bundle, I stamped various elements in black using the Botanicals and Feeling Floral stamps and I die cut each shape or fussy cut - depending on if dies were available for the set or not. After I had a whole bunch of pieces to work with, I started assembling various collages on the background using glue, foam tape and a Xyron sticker machine for the fine dies to add dimension to the cards. All the leftover pieces I tucked inside to the matching stamp or die storage pocket to use for future cards. Wow! Beautiful and so elegant!!! Beautiful cards!! The black and white is so striking and I love the pop of color in the backgrounds. I LOVE theses cards great background! I also love the word dies! Love this idea! Beautiful simple elegant. What great cards! Love the simplicity of the designs & the pop of color in the background.